1. Combine hemp milk and coconut oil in a saucepan and melt. Keep warm enough to ensure oil does not re-solidify. 2. 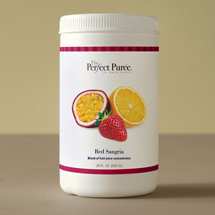 Combine The Perfect Purée Red Raspberry Puree, lemon juice and grapeseed oil. 3. Drain excess liquid from silken tofu. 4. Mix sugar, lemon zest and salt in a food processor until combined. 5. Add Tofutti to sugar mixture and run processor until combined. 6. Once the mixture is smooth, add silken tofu. Run processor until no lumps remain. 7. Add purée mixture, pulse to combine. While processor is running, slowly drizzle in coconut oil/hemp milk mixture. 8. 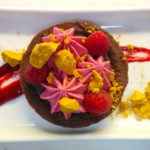 Transfer to a storage container, place plastic wrap on the surface of the mousse (it will be loose at this point), and refrigerate overnight.